For as long as I remember, my mom has made this exact fruit salad. It’s as much a part of my childhood and growing up as birthday cake and Santa Claus. That is to say, I can’t imagine my life without it! Every Christmas Eve morning, without fail, Mom’s fruit salad shows up alongside biscuits and gravy, sausage, eggs, and coffee cake. The splash of color it provides among all of that tasty brown food kinda of makes us feel a little bit better about ourselves. It also provides us some healthy competition as my brother and sisters and I try to see who can sneak as many bananas as possible out of it before a) Mom notices or b) another sibling catches us. So not only is it delicious, but it’s fun for the whole family, too! Whether you’re serving an Easter brunch, heading to a potluck, or simply want something to keep in the fridge to serve alongside breakfast through the week, this salad fits the bill. So let’s get to it, shall we? As my able-bodied assistant here shows you, it’s so easy a first-grader can make it! All of the ingredients but one are found in either the pantry or the freezer, so it’s year-round goodness! It’s a total crowd-pleaser. We’ve never taken it anywhere that it wasn’t devoured. Two words: cost effective. You can make an absolute ton of the stuff for under $10. Now, just a quick note. The ingredients you see here are for the medium-sized version of the recipe. I’ve included both Mom’s original boatload of a recipe and the modified medium sized version that I make for my family in the PDF below. Just for reference, what you see in the pictures here is the medium version and is enough to feed my family of 6 twice over. No, Publix didn’t sponsor this post. It just goes to show you exactly how economical the recipe is! 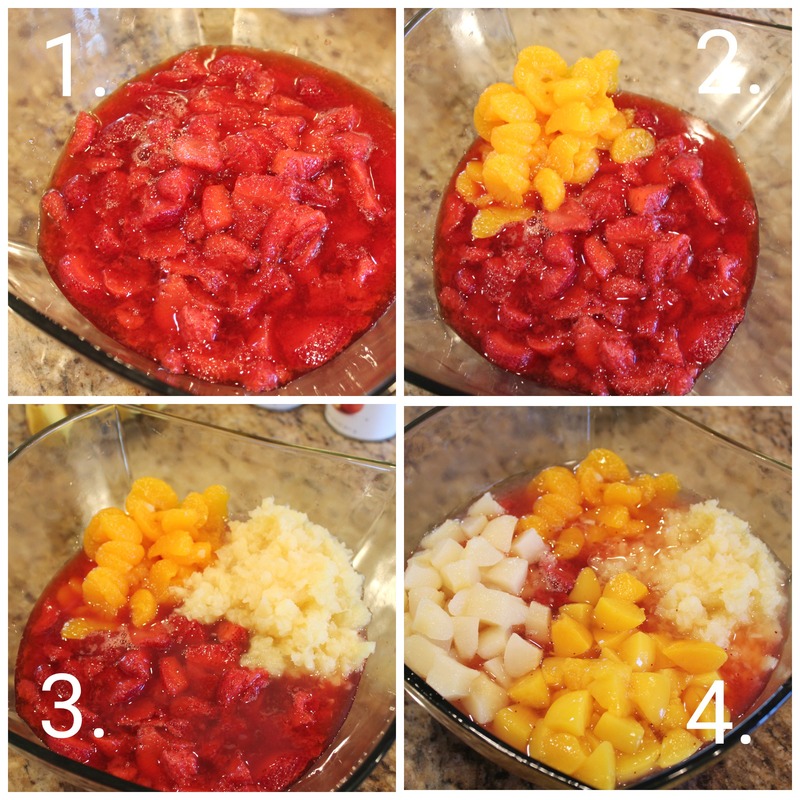 In a large bowl, combine the strawberries, oranges, and pineapple. Cut the peaches and pears into smaller, bite-sized pieces. Add them to the bowl. 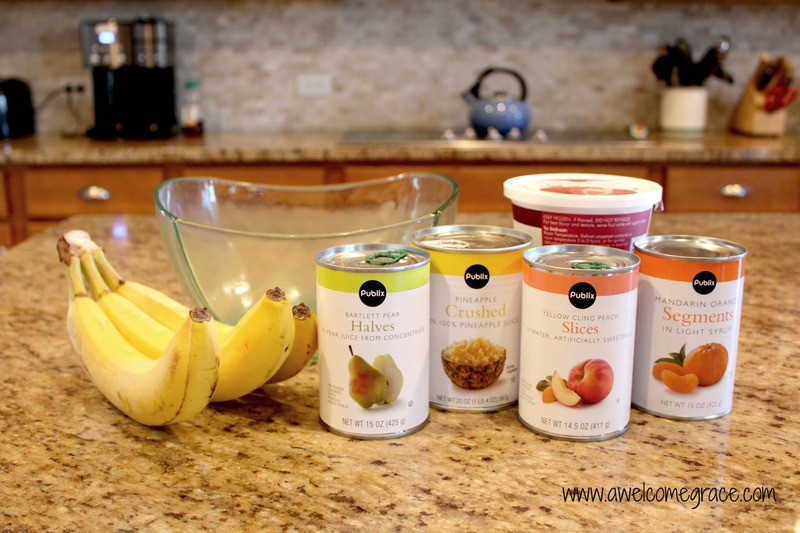 Stir to combine and refrigerate until ready to serve. 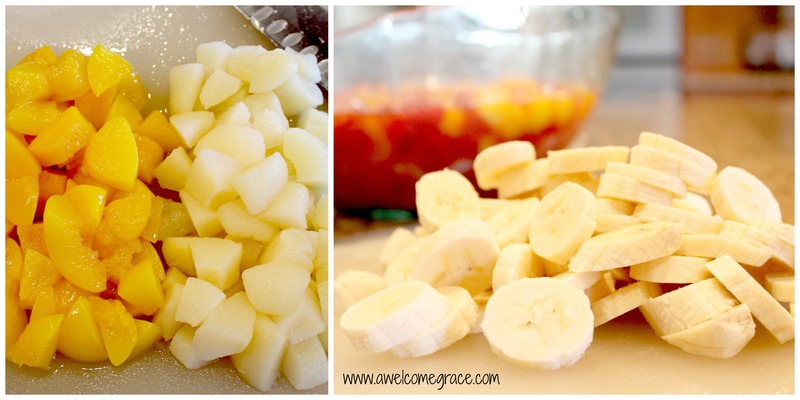 Just before serving, slice the bananas and add them to the bowl. Stir and enjoy! I served this for dinner last night along with BLTs and an open bag of chips. No muss, no fuss! 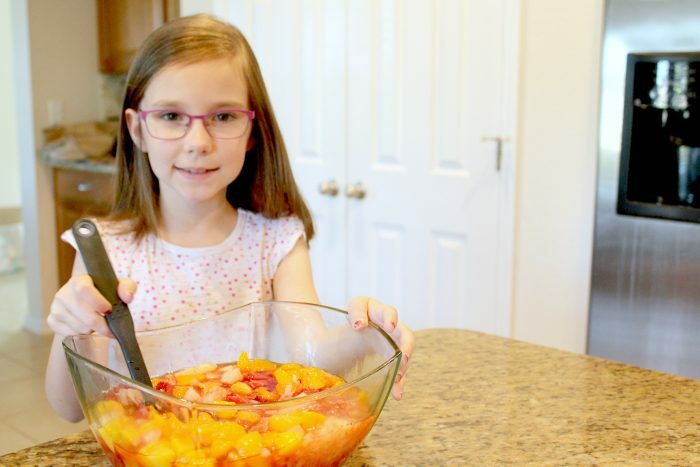 And by the way my kids reacted when they saw Grandma’s fruit salad on the table, you would’ve thought God Himself had delivered it from the heavens. Make it for people you love soon — they’ll thank you for it! 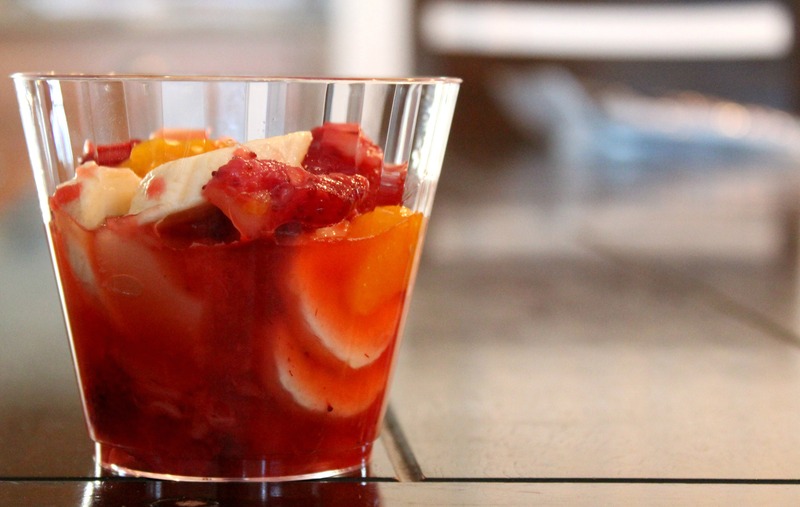 Oh yes – this fruit salad is a winner!